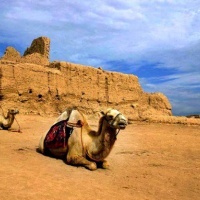 Gaochang (Kocho, Kharakhoja or "King City") is the site of an ancient oasis city built on the northern rim of the inhospitable Taklamakan Desert in Xinjiang, China. Anciet Gaochang city was built in the 1st century BC. Gaochang served long as a busy important trading center, and a stopping point for merchant traders traveling on the Silk Route. It was burnt down in wars in the 14th century. 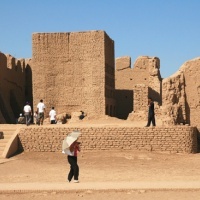 Old palace ruins inside and outside the city, located 30 km southeast of modern Turpan, can still be seen today. 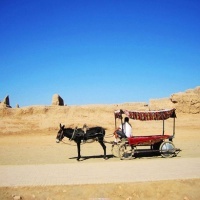 Gaochang Ruins, Turpan Xinjiang, Travel ChinaGaochang was founded as a garrison town in the 2nd century BC, it later served as a thriving capital of the Han Qu family Kingdom of Gaochang controlling over twenty other towns, roughly the area of modern Turpan. A large Tang army of the Taizong emperor defeated the non-cooperative kingdom in 640, and it was under Tang control until the 9th century - much of the period as a Tang administrative seat. 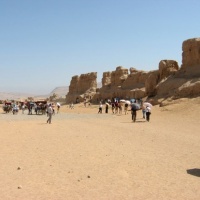 From the 9th to the 14th centuries it served as the capital of the Uygur Kharakhoja Kingdom. It was successfully attacked by the central Asian prince Khizr Khodja and then abandoned in the late 14th century. At its height Gaochang had a multi-ethnic population of perhaps 30,000 and was doubtless an impressive sight to those on caravans. Its massive rammed earthen walls, occasionally reinforced with adobe, were 38 ft (11.5 m) high and about the same thickness. The area included the roughly square outer city 3.4 mi (5.4 km) long with nine city gates, a rectangular inner city that was 1.86 mi (3 km) long, and the palace city at the northern part that adjoined the northern segment of the inner walls. Gao Chang played a key role as a transportation hub in western China. There is not much documented history surviving today, only stories passed on through oral tradition exist to detail the history. The archaeological remains are just outside the town at a place originally called Idykut-schari or Idikutschari by local residents (see the work of Albert Grünwedel in the external links below). Artistic monuments of the city have been published by Albert von Le Coq (see external link below). Since 1961 Gaochang has been a major historical site under state protection. Looking down from high ground nearby, the visitor can see that the ancient city is in the shape of a rough square surrounded by a deep moat, the outline of which is still clearly visible. It is made up of an outer wall, an inner wall and palace walls. With a twelve-meter thick base, the outer wall is 11.5 meters tall and 5.4 kilometers in circumference. Built with layers of rammed earth, each layer of the wall ranges from eight to twelve centimeters in thickness. Some reliefs of horseheads still remain intact. There were probably three gates in the southern wall, while the remaining three sides had twogates each. The best preserved gates stand on the northern andwestern sides. Outside the gates are walled enclosures for defense. The inner city wall, of which the southern and western parts are still intact, was also built with rammed earth at an earlier date than the outer wall. The palace walls stand in the northern part of the city, pressed between the inner and outer walls. After the city of Gaochang had been abandoned, the area was turned over to farmland and most of the buildings were destroyed. Among the ancient relics still standing today is a temple covering an area of 10,000 square meters in the southwestern corner of the outer wall, consisting of gates, courtyards, a scripture-preaching hall, a library for scriptures, a main hall and living quarters for the monks. This shows Gaochang was also an important religious center for Buddhism under the Tang once. Some major sections of the outer walls remain along with outlines of a number of now destroyed buildings. There are remnants of two major temples in the southern part of the outer city, one with some impressive fresco remains; there is also a square adobe Imperial Palace ("Khan's castle"), once with twelve gates and perhaps guarded by 900 soldiers. The general pattern of the well-ordered streets, similar to those of the Chang-an capital city of the Tang, can still be somewhat seen in the mud-brick ruins.